Plantain is a beneficial green weed that commonly grows in yards and driveways. You can use the leaves to make a fantastic infused oil, that can be incorporated into salves, lotions, creams and soaps. 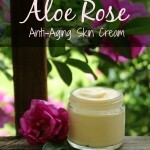 It’s excellent at soothing any type of itchy or inflamed skin condition. Lavender essential oil adds a light fragrance and some of its own skin-soothing properties. Another option is to add lavender buds to the oil, while infusing plantain, for a faint lavender scent. You could also skip the lavender, and just make an unscented lotion, instead. I chose sweet almond oil for its nourishing and skin softening properties, but you can use most any type of oil that you wish to, in order to customize this lotion for your preferences and the ingredients you have on hand. A scale works best for lotion making, so that every batch is consistent and without surprises, but I realize not everyone owns one, so developed this recipe so it can be measured by volume as well. 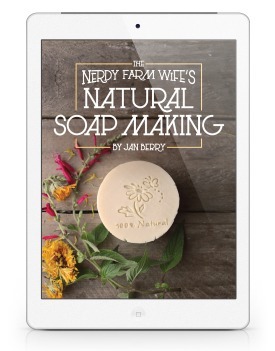 This lotion uses vegetable emulsifying wax NF, instead of the beeswax used in some of my other recipes. 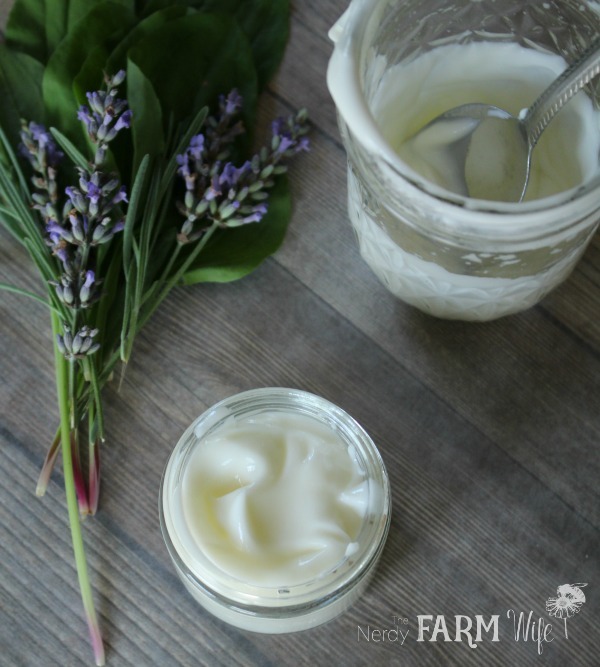 Some versions out there are made from petroleum products or have sketchy additives, which is why I like to use only vegetable-derived Emulsifying Wax NF from Mountain Rose Herbs in my lotion recipes. 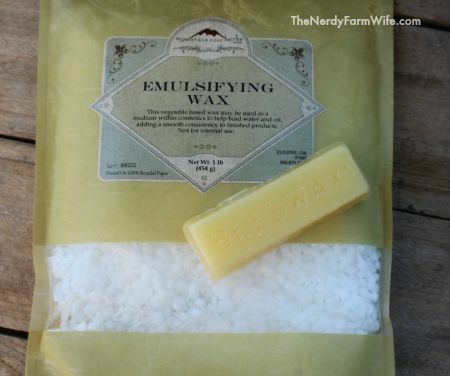 The “NF” means it’s National Formulary approved, and made to a standardized formula, so any type of “NF” emulsifying wax that you find, should work in a comparable way. 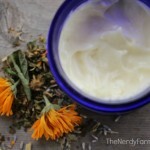 If you don’t want to use emulsifying wax, you can still adapt the same idea of substituting plantain infused oil and adding lavender essential oil to an existing beeswax-based cream recipe (like THIS ONE or THIS ONE), but don’t try to directly substitute beeswax for the emulsifying wax in this particular recipe. It won’t work, because beeswax requires a much higher oil to water ratio to prevent separation issues, which is why beeswax-based lotions and creams are richer and heavier. Before you can make this lotion, you’ll need to make some plantain-infused oil. To do so, collect plantain leaves from your yard (make sure they haven’t been sprayed with pesticides) and spread them out in a single layer over clean dishtowels or paper towels. Allow to air dry for a few days. You could also use a dehydrator, set to a very low temperature, if you’re in a bigger hurry. If you don’t have a source for plantain leaves, you can buy some HERE, at Mountain Rose Herbs. 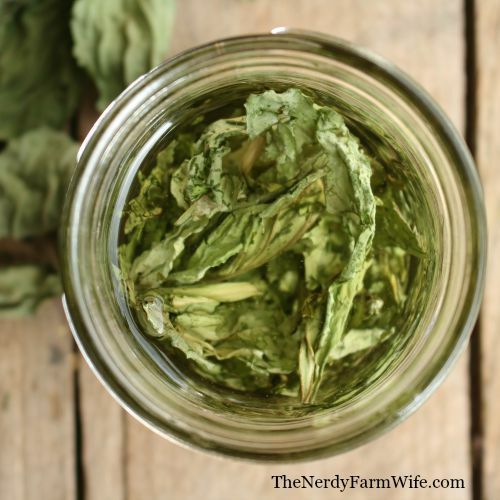 Place the dried herbs in a canning jar, until it’s about half-way filled. Jar size will depend on how much plantain you have available and how much oil you want to infuse. It will vary for each person. I like to make up a big jar at a time though, since the oil can be used in so many great ways! Pour the sweet almond, or your chosen type, of oil over the leaves, until the jar is filled. Stir gently to release air bubbles. At this point, you can infuse the slower way, by capping the jar and tucking it in a cupboard to steep for at least 4 to 6 weeks. Or, if you’re in a bigger hurry, you can set the uncapped jar down into a saucepan containing an few inches of water. Set the pan over a low heat burner for around two hours, or until your oil is infused to your satisfaction. Keep a close eye to make sure the water doesn’t evaporate out, while the oil is infusing. Once the oil is infused, strain and pour into a clean, dry jar. If stored in a cool, dark place, your plantain-infused oil should stay fresh for around 9 months to 1 year, for you to use in various projects, as needed. Remove both containers from heat. Pour the melted wax/oil mixture together with the hot water. I like to pour this back and forth between the containers a few times. As the two liquids meet, the mixture will instantly turn white as the emulsification process begins. Stir the lotion for around 30 seconds then let it cool for around 5 minutes, stirring occasionally. To speed things along, you can set the jar in a bowl with a bit of ice water. Your lotion will thicken further as it cools and as you stir. It might take several hours before it fully sets up. My niece taught me another trick for speed setting lotion – cap the jar (or plastic bottle, for the littles) and hand it to an energetic and exuberant kid to shake-shake-shake! 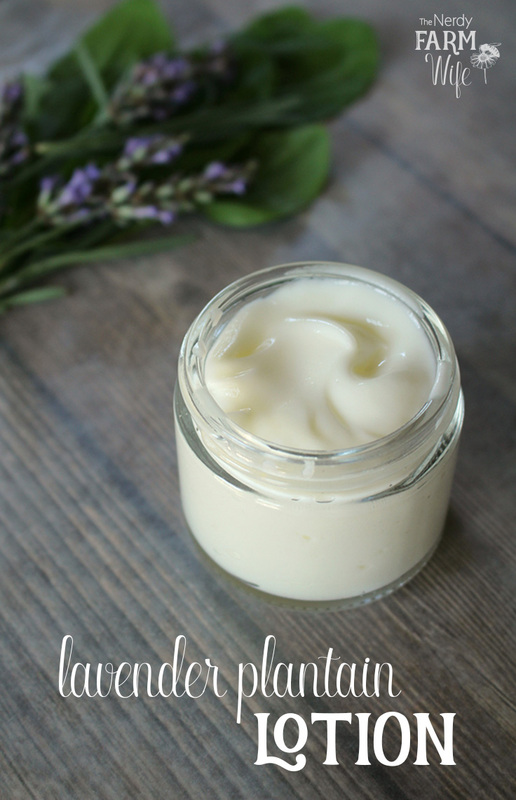 When the lotion is cooling, but not completely cool, stir in a few drops of lavender essential oil, if using. Next, I add a nature-derived preservative. I spent the last several months testing several natural preservative options, using microbial test kits to see which ones were really effective, and finally decided that Leucidal Liquid SF will be my go-to preservative for now. (Read my entire article on Natural Preservatives HERE.) Leucidal Liquid SF should be used at a rate of 2 to 4%, which equates to 2 to 4 grams for a 100 gram recipe. This recipe is 97 grams; I round up and add 4 grams of preservative. If measuring by volume, note that 2 grams of Leucidal Liquid SF = not quite 1 full teaspoon. 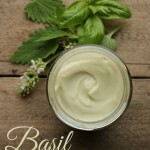 If you don’t wish to use any type of preservative, keep your lotion in the refrigerator and use it up within one week. Spoon your cream into a glass jar and you’re done! Apply it as needed on hands, face and body. 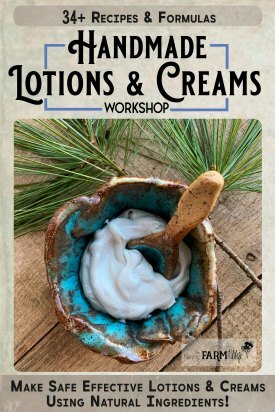 The great thing about homemade lotion is that you don’t need to apply tons of it to be effective. Tagged lavender, lotion, plantain. Bookmark the permalink. Hi Please tell me where do you purchase Pine Tar for your Pine Tar Soap recipe? Hi Tammy! If you check the recipe: https://thenerdyfarmwife.com/pine-tar-soap-recipe/ There’s a link that will take you right to it, in the recipe ingredient list. It’s pretty expensive that way though, so first check out the horse section of local feed or farm stores first to see if they have a better price for you. Random but just curious, where do you get your microbial test kits? How long does this lotion stay fresh? Hi Rose! It depends on a lot of factors. If you use distilled water, instead of tap water, that will help it last longer. How you store it matters too. If it’s kept in a hot humid bathroom or someplace like that, then it might spoil faster. If you put it in a jar and use dirty fingers to dip into it, it might get germs in there faster. If you use a pump top or squeeze bottle, it will have less chance of getting contaminated. If you don’t use a preservative at all though, you should use it up within 1 to 2 weeks and keep it in your refrigerator. If you do use a preservative, it will depend on what type you use. Some synthetics out there (I think like optiphen and such) will last over a year. I like to use nature-derived preservatives though and they’re milder. So far in my tests, Luecidal Liquid SF (a probiotic type additive) is going strong at almost four months, so I usually feel comfortable saying at least three months if using that particular preservative. So thrilled you mentioned (and explained) a natural derived preservative too!! Thank you, thank you! :) Something I have been wondering..searching and struggling over. xo lol..
Hi Jan! Your website is fantastic, I have throughly enjoyed reading and trying many of your great recipes, so thank you for all of the work and research you do and share! Do you think that I could use a flower water/distillate (maybe lavender) instead of plain water in this recipe? Hi Elizabeth, I’m happy that you like the site! I think that a floral water would be very lovely in this recipe! Hi Jan! I had a question about how well the preservative blended in, looking online I see Leucidal Liquid SF is ‘immiscible’ with oil, but does this factor change because it’s added to an emulsified mixture? You don’t have to add it to the water before emulsifying it with the oil? It mixes in well at the end? Wondering because I’m considering purchasing it on your recommendation :) I tried Optiphen + but it was really difficult for me to work with. Thank you!